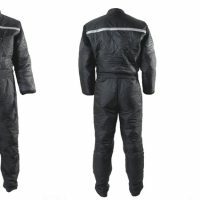 The Santi E.Motion PLUS drysuit model comes as an optimal and ultimate combination of the flexibility and lightness from E.Motion Ripstop quality and E.Lite durability and comfort. The Santi E.Motion Plus is equipped standard with SANTI soft socks, Santi SmartSeals a 6mm or 9mm hood of your choice, STAY DRY travel bag, LP inflator hose, talc powder, and more. Alterations: We have found that the large majority of our Santi Diving suit purchasers are able to fit one of our standard size rental or stock suits with just a few alternations or modifications and given that the standard size suits include up to four alterations at no charge, it is much more economical and easier for Santi to focus on this rather than trying to complete a full MTM suit for people that don’t really need it. This allows you, the customer to try a stock suit at DDS and see for yourself the areas that may need modification and removes some of the risk involved with complete MTM products. Please note that the four measurement changes are limited to 4-5 cm in each alteration. Custom Fit is available at a premium price as well. Please allow approximately 95 days. Cost is approximately $900 more. Colour Changes are available when you deviate from the standard stock colour scheme of a Santi Emotion Plus drysuit. Cost to alter the colour scheme is approximately $100cdn. The Standard Boot for 2018 is the Santi FlexSole boot which offers superior comfort and performance. Purchase a Santi drysuit and Santi underwear package together for additional discounts of at least $250 as a package ensemble.